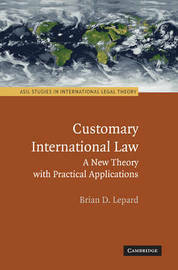 Customary international law, although long recognized as a primary source of international law, remains replete with enigmas, both conceptual and practical. These include how to determine the existence of opinio juris, the function of the state practice requirement, the definition of jus cogens customary norms, and the relationship between customary international law and ethics. In part because of these enigmas, the subject has generated a wide-ranging literature. However, no recent book-length work has attempted to articulate a comprehensive theory of customary international law that can effectively resolve these questions. This book sets out to accomplish this goal. Its approach is unique in a number of ways. For example, it is multidisciplinary and draws insights from fields such as legal theory, philosophy, political science, and game theory. In addition, it is anchored in a sophisticated ethical framework and explores at length the interconnections between customary international law and ethics. Brian D. Lepard is Law Alumni Professor of Law at the University of Nebraska College of Law and co-director of the university's Human Rights and Human Diversity Initiative. Professor Lepard has served as Chair of the International Legal Theory Interest Group of the American Society of International Law. His books include Hope for a Global Ethic: Shared Principles in Religious Scriptures (2005) and Rethinking Humanitarian Intervention: A Fresh Legal Approach Based on Fundamental Ethical Principles in International Law and World Religions (2002). His articles have appeared in such journals as the Duke Journal of Comparative & International Law and the Journal of Human Rights.